AUSTIN, Texas, Jan. 7, 2019 /PRNewswire/ -- This week at CES 2019, Resideo Technologies, Inc. (NYSE: REZI) is announcing its latest Honeywell Home™ T-Series Smart Thermostats: the T9 and T10 Pro. Featuring innovative wireless smart room sensors, the new T-Series Smart Thermostats effortlessly help deliver a desired temperature when and where it's needed. "A smart home is only as smart as you make it," said Mike Nefkens, president and CEO of Resideo. "Our latest smart room sensors extend the reach of your thermostat – beyond the hallway – and adapt to your life in real time to make your connected home truly a smart home. They effortlessly control temperature in any room when you're home, and offer energy savings when you're away." According to Parks Associates research, 56 percent of consumers believe that an uncomfortable room temperature impacts their sleep quality and quantity. "There is demand for a smart thermostat that can help them intelligently adjust their bedroom temperature for optimal sleep comfort," said Jennifer Kent, Senior Director, Parks Associates. People detection. Whether, sleeping, cooking or relaxing, comfort follows the family as they move throughout the home. The smart thermostat knows which rooms are occupied and can automatically adjust that room to the desired temperature. Unmatched range. Not all sensors are created equal, and the Honeywell Home smart room sensors offer a 200-foot range to help deliver whole home comfort. Set a preferred temperature in any room at any time, and prioritize multiple rooms at different times of day. For example, parents can ensure everyone is sleeping at a comfortable temperature at night. Switch which room is prioritized (i.e., lower the temperature in the kitchen when the family is using the stove to make dinner), or use a popular voice assistant or smart home platform to change the set schedule. Use geofencing to monitor and activate the home's heating/cooling system, and come home to their preferred temperature. Receive alerts if a room reaches a certain temperature, such as a nursery getting too cold at night. Resideo enhanced the thermostat's full-color touch display to closely resemble the Honeywell Home mobile app for more intuitive, streamlined use. The T9 Smart Thermostat can configure itself with its wire-sensing technology and includes a C-wire adapter, making do-it-yourself installation very simple. The T10 Pro Smart Thermostat is installed professionally as it also offers humidity and ventilation controls. The latest T-Series Smart Thermostats will be available in North America this Spring. At launch, the thermostats will integrate with Amazon Alexa and Google Assistant. 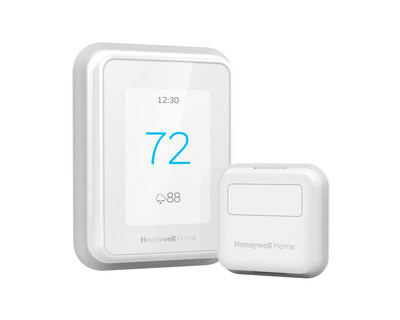 The Honeywell Home T9 Smart Thermostat and one sensor will be available at major retailers nationwide and at HoneywellHome.com (MSRP $199.99). 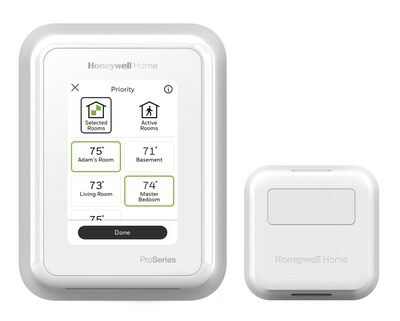 The Honeywell Home T10 Pro Smart Thermostat will be available via professional heating and cooling contractors. Additional smart room sensors can be purchased in a package of two for $79.99.